– Out of the Park Baseball is Ian and Steve’s favorite baseball game and it should be yours, too! OOTP ’17 arrive on March 22 and is available NOW on OOTPDevelopments.com! Use the promo code PHILLIES17 to get 10% off OOTP Baseball ’17! 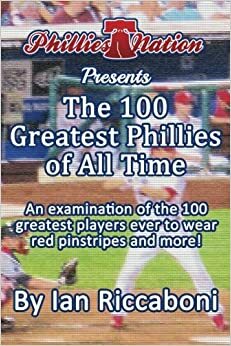 – 100 Greatest Phillies of All Time by Ian Riccaboni – now available on Amazon! The digital copy can be yours for free if this podcast receives 15 Five Star reviews on iTunes by April 1! Get to writing and help spread the word of the PN Podcast and we’ll share the 100 Greatest Phillies of All Time! We are just three away from hitting our goal – head over to iTunes, write us a review, and help us give away the 100 Greatest Phillies digital edition! Ian Riccaboni is joined by Dan Szymborski of ESPN and FanGraphs in a chat recorded the evening of March 23. Thankfully – no drastic changes to the fabric of the Phillies occurred in that time! Dan and Ian talk about ZiPS, its accuracy as a projection tool, are young players more difficult to project, why pitchers are so tough to project, the outlook for the 2016 Phillies, and what it would take for the Phillies to earn a playoff spot in 2016 (hint: odds right now are only about 1 in 200!). Specific talk is had on J.P. Crawford, Maikel Franco, and Aaron Nola. Should Ruben Amaro get any of the credit if the Phillies end up turning things around quickly? Was it due to the “secret analytics lair” that Amaro claimed to have in an interview? How did the Phillies screw up so badly in the amateur drafts from 2008 through 2013? Dan and Ian touch on the robust MLB Free Agent class of 2018 and discuss why Phillies fans should get excited about that year! Hint: they will have lots of money and Bryce Harper is on target to be a free agent. Dan and Ian briefly talk wrestling and why baseball needs more fun – a weird conversation coming from two stat-heavy baseballsmen! Be sure to check Dan out at @DSzymborski on Twitter and read his work on ESPN and FanGraphs!